The Quest system is a great deal for offices looking for value, simplicity, and increased patient throughput. The system is easy to use because it features a touch screen with convenient pull-down menus for intuitive workflow. The proprietary Logistep guide walks users through the test by highlighting the next step. Everything you need is on one screen, so there’s no need for toggling amongst screens. To save you time, an easy way to correct unintentional phase changes has been added, without having to start all over again. Configure the system with a Cardiac Science TM55 or TM65 medical treadmill and your office will be up and running. *Flexibility. Quest offers 11 standard, pre-programmed protocols and allows you to perform resting 12-lead ECGs and exercise stress tests. *Connectivity. The system is compatible with Ethernet protocols, our Pyramis data management system, and our HeartCentrix connectivity solution. *Accuracy. 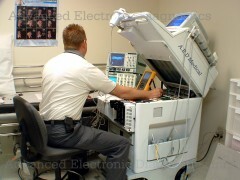 The system eliminates non-cardiac electrical noise and baseline wander for clear ECG tracings. *Simplicity. Just point and touch the intuitive touch screen – that’s all there is to it. *Ease of use. The Logistep feature walks users through the test by highlighting the next step. *Confidence. Opt for the University of Glasgow ECG interpretation algorithm to consider clinically significant criteria to interpret patient data. *Real-time. Quest’s large screen instantly displays 3, 4, or 6 channels and freeze frames for detailed reviewing and printing.